It’s a very long time ago now, but if you warped back to the mid nineteen seventies and did a survey of the most popular phono cartridge in existence, this would surely win. 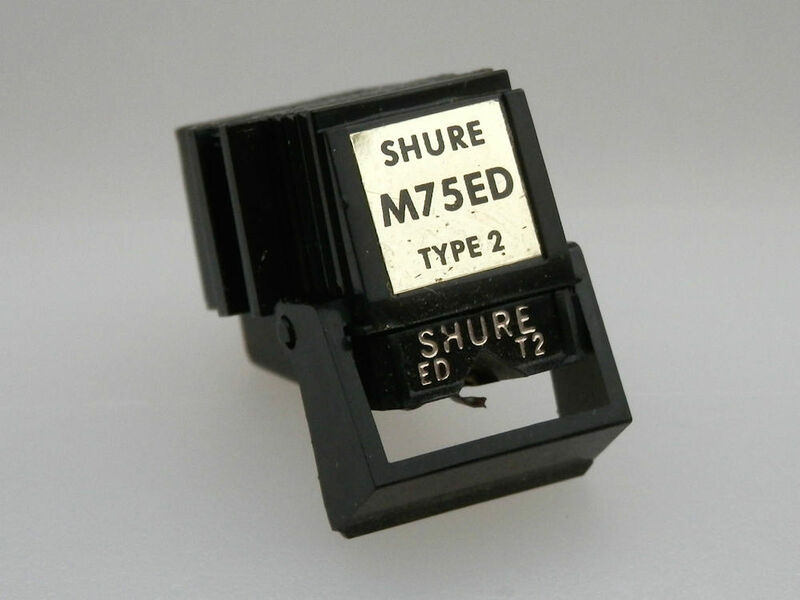 From around 1974 to 1979, the Shure M75ED ‘Stereo Dynetic Cartridge’ seemed to come fitted to almost every single new turntable on sale. Of course, your Linn Sondeks of this world didn’t stoop quite so low, but if you remember that most new decks cost under £100 – and indeed many under £50 – then this mid-priced Shure was perfect. It was largely down to the American company’s sheer size and historical provenance. Founded in 1925, Shure Brothers Incorporated had specialised in phono cartridges and microphones for a very long time and had powerful international distribution. But it was also down to the fact that the M75ED was a fine sounding device in its way, and very much right for the time. The M75ED was a lowish mass device, weighing 6.2g, with an inductance of 720 millihenries, a DC resistance of 630 ohms and an optimum load of 47k ohms. It could be wired to work in mono, and Shure claimed it was compatible with all four channel matrix systems for quadraphonic use. As was the norm, it had a detachable stylus with guard built in, and its soft plastic body was easy to fit, use and cue. Being a highish compliance design, it was ideal for low-to-medium mass tonearms, and found a willing partner in the SME Series III that took the hi-fi world by storm in 1978. Before that, the SME3009 S2 was most people’s idea of its ideal home. Sonically, the M75ED has a distinct sound. Powerful, punchy, fast, edgy, pushy, propulsive and fun – it was a dramatic contrast to price rivals such as the Ortofon FF15E. Whereas the latter was smooth, even, subtle and measured, the Shure was the polar opposite, lacking delicacy and proportion – everything is pushed right at you and delivered in a laceratingly fast and thrilling way. As it happened, the Shure matched the soft, smooth sounding budget turntables of the day – the likes of Pioneer’s PL-12D and Trio’s KD-1033 were synergistic partners. These days, you don’t buy an M75ED because it gives the best sound around. Rather, it has a very ‘period’ performance, and is a good mechanical match to the lowish mass tonearms from the late seventies such as SME 3009s. Surprisingly for something that was once so ubiquitous, secondhand prices are now high – collectors have a high regard for them. Expect to pay £30 to £70 depending on condition, overall ‘mileage’ and provenance. I had one of these in an Acoustic Research Universal turntable and arm from 1974 to 1979. Prior to that an M75EJII in a Sugden Connoisseur BD2 turntable.A great intro to LP sound! I never did graduate the the V15III, which was Shure’s top of the range, I think.I then moved on to Decca London Golds and the Garrot Micro-scannered version of this which I thought was the ultimate moving magnet cartridge, so dynamic on percussion it made people jump.